This Christmas Chocolate Wafer Coconut Roulade is made with a biscuit base crust and is filled with pastry cream, topped with chocolate ganache. The other night when I was making the Almond Paste for the Christmas cake, I had two egg yolks which I wanted to use. I decided that the best way to use them was to make a custard cream. 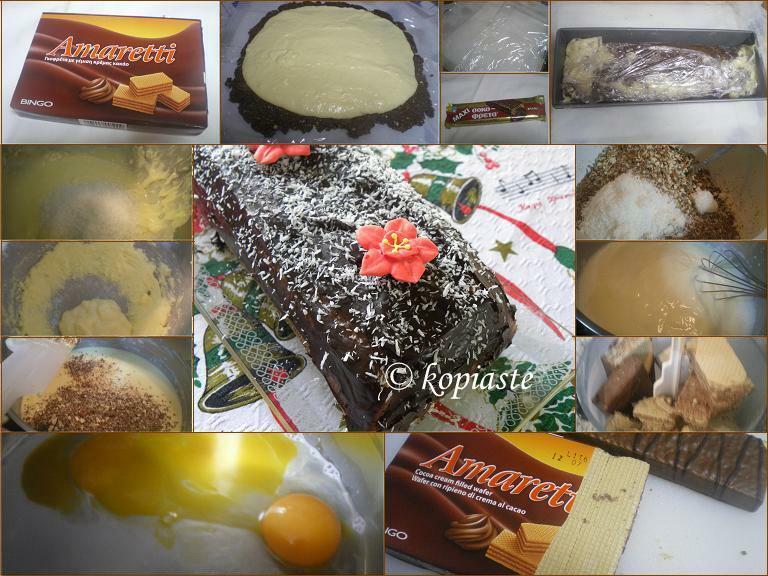 However, I still wanted to make a similar Espresso Coconut Roulade I saw at a friend’s blog but unfortunately there were no eggs in that recipe. I had already bought the biscuits and coconut and was still determined to make the roulade with a few tweaks on my part. In order to make the roulade you will have to use cling film to shape it and then put it in a loaf tin in order to set. The following day I removed the cling film and covered it with chocolate ganache and sprinkled some coconut on top. The flowers on top are edible and came all the way from Cyprus. These were intended for my Christmas Cake decoration but I still have a lot left for the Christmas Cake. You can see my Christmas Cake, which I decorated with more edible decorations. Do you like the tablecloth in the above picture? I embroided it and also made the lace 25 years ago when I was pregnant to my second son and was confined to bed all day, as I had some problems with the pregnancy. I didn’t like it and never used it before but today when I was taking out my other Christmas tablecloths I saw it and I realized that it would be perfect for Christmas. Start with the pastry cream, as it will need some time to cool. In another saucepan, add the yolks, cornstarch and sugar and whisk. If you cannot mix it, add a tablespoon of cold milk and mix it. Add the hot milk whisking continuously and put it on the heat until the cream sets. Add the vanilla essence, mix and set aside to cool. In a food processor, add the wafers, a few at a time and powder. Empty them in a big bowl. Do the same with the almonds but do not powder completely. Add to the bowl. Add the coconut and set aside. Prepare the Buttercream. Add the butter, sugar and vanilla in the mixer bowl and whisk until white and fluffy. Stop the mixer and scrape down the butter a few times, if necessary. When the custard cream has cooled start adding it to the butter cream until it is incorporated. Mix in the coconut and set aside. In the same saucepan where the custard was, add one egg, 30 grams (1.05 oz) butter and the half-half cream and whisk on low heat. As soon as the butter melts remove from the heat and start mixing in the wafers with all the other ingredients to make a thick paste. Finally add the Espresso Cherry liqueur and mix. Cut two pieces of cling film about 40 cm each and join together. Spread the crust which should be about 1 cm thick and on top add the cream. Lift the edge of the cling film and roll into a roulade, leaving the cling film outside of course. Place in a loaf pan and refrigerate until the cream has set, for about two hours. In a double boiler, add the couverture, butter and cream simultaneously and on low heat mix until the chocolate melts. Spread over the roulade and sprinkle some coconut on top. Decorate with edible candy or spoon sweets (fruit preserves). It seems that there is a problem with intense debate comment widget. I've been having problems leaving a comment on other site and I have been receiving multiple comments from others trying to leave me a message. It's so wonderfull, and I can imagine the taste !!! Ivy, I had some similar problem with ID comment system, that's why I deleted it and back to the default blogger comment form. The cake looks so lovely with 3 orange red flowers. This look beautiful and sounds fantastic!!!! A gorgeous roulade! It must taste divine! looks very delicious, love the edible decorations! Happy holidays. Wow, Ivy! This looks really delicious! 🙂 I love the tablecloth!!! Ivy, I hope you didn't get 3 same messages from me….first two replies was I told that something wrong with the page, and after 1 hour, I tried one more time, and it finally worked. I can imagine eating this with my coffee any time of the day. Looks beautiful and so so yumm. Οοοοh, I am drooling. What a lovely combination of flavours and lovely presentation. Love your tablecloth. I wish I knew how to embroid. this is stunning and something that simply wouldn't last a day in my kitchen! Your tablecloth is gorgeous Ivy! And so is this roulade. It's a beautiful dessert for the holiday table! Gorgeous roulade! I love the flowers, so pretty! such a beutiful roulade,with so delicate flowers! you are really in the Christmas mood, Ivy… 🙂 what a beautiful and yummy roulade…! Christmas is upon us, your Yule log looks fab and I wish I was there to sample it. Bring it on! Bring it on! The merry pretty things 🙂 Very beautiful! I am drooling over this one for sure! Chocolate and coconut is one of my favorite combos and how could anyone not LOVE custard and pastry creams? Yum, looks so decadent and delicious! 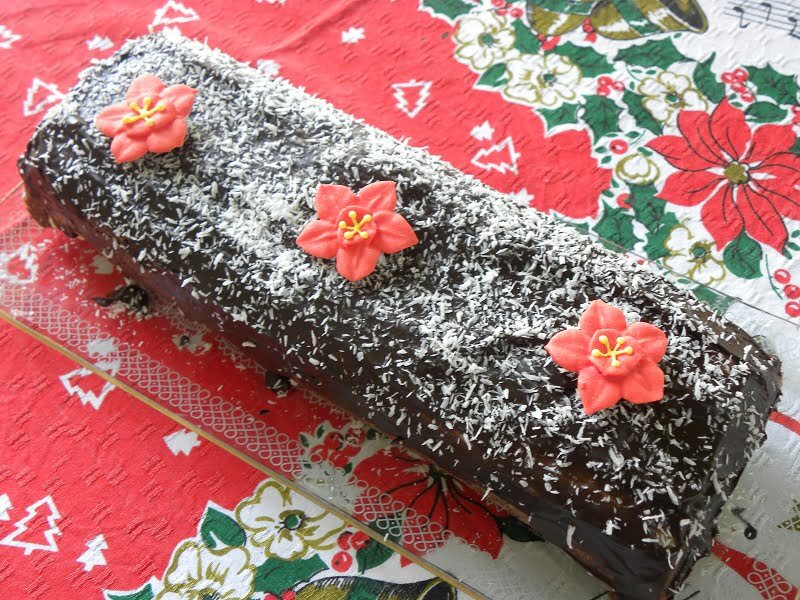 This Christmas Chocolate Wafer Coconut Roulade is looking delicious. It sounds so interesting. I will try out this yummy recipe. Thanks for the share.